The controversial lawmaker and well-known critic of Pres. Rody Duterte, Sen. Antonio Trillanes made headlines anew for his heated conversation with veteran journalist and TV host Ben Tulfo during the Senate Committee hearing about the alleged P60-Million Advertisement deals. Sen. Antonio Trillanes started his statement by saying that a plunder case is punishable by reclusion or perpetual or life sentence and already accused the Tulfo siblings of allegedly committing plunder despite the fact that there is no investigation yet under any court of law. Sen. Trillanes stated that the ascertion of Sec. Wanda Teo that she don't knew about the P120-million she disbursed in the TV ad will be given to his brother's company. The former DOT Secretary responded by saying that the case is already in the Ombudsman, that silence the senator. The senator also concluded that whatever the statement released by Sec. Wanda Teo about the said controversy is indeed unbelievable at the eyes of the general public despite Trillanes having no such proof of his ascertion. Sen. Trillanes also made an unsolicited conclusion that the former DOT secretary is reckless on her job as head of the agency. Whenever Teo made an answer about the allegations thrown by Trillanes, he immediately uses his parliamentary privilege of calling the attentions of the Blue Ribbon Committee chairman which only shows that the resource speakers don't have the same right as what the senators enjoyed during Senate hearing. During the time when Sen. Trillanes asked Ben Tulfo, he immediately asked on how much the total money Tulfo received from the DOT. Ben Tulfo burned down Trillanes by responding "Your honor, meron ho kaming corporate account check, we have to account everything, kung magkano ang ibinayad sa amin. So on hand I don't have the record but we can present it maybe in a court of law," Tulfo stated. 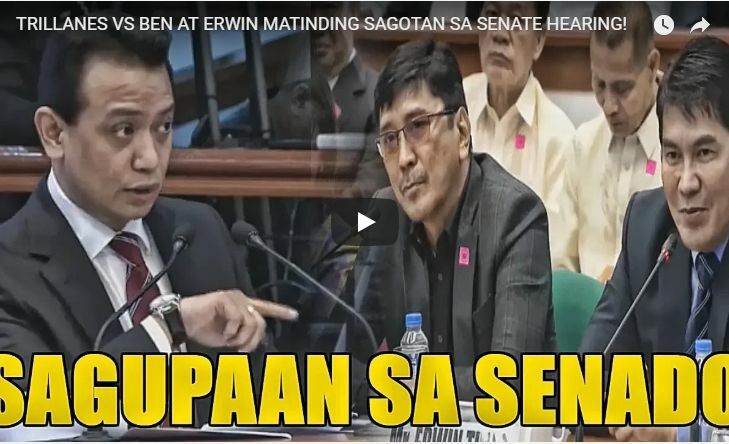 The heated conversation between Sen. Trillanes and Ben Tulfo started, and even if Tulfo did not finished the answer first, immediately Trillanes made some ad hominem statements and tried to disrupt the explanations made by Ben Tulfo.